Students attending colleges and universities in Texas are required to learn about Texas politics, yet many students and professors know little about the way Texas government works. When Jim Henson began the Texas Politics Project around 2001, it took the modest form of an open-source online textbook intended as a resource for teachers, professors, and students for fulfilling this requirement. It was not long before it expanded into a much more extensive program for teaching Texas politics. 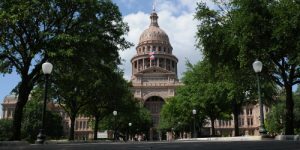 The Texas Politics Project began conducting statewide public opinion polls in 2008, which have now become a crucial aspect of the Texas political landscape. In more recent years, the Texas Politics Project has expanded to include online courses, internship programs, and other events and seminars to inform public political debate and engagement across the state of Texas. I spoke with Jim Henson, the Director of the Texas Politics Project, to learn more about the origins and evolution of the project. Zoya: Could you talk to me a bit about the Texas Politics Project and how it got started? Jim: The Texas Politics Project grew out of the fairly basic project of building an online textbook about Texas government in the early 2000s. We wanted to create an open-access resource that students and professors could use in class, but we also wanted something that would be a public resource for people who needed to know or were interested in Texas government and politics. Once we got the site up and running, it gained some success not only at UT but at community colleges and other colleges around the state. That led to us branching out into running the government internship program, which in turn put me in touch directly not only with students working in government but with the people they were working for at the legislature. After that we began doing public polling, which led into the partnership with the Texas Tribune. In the midst of all that, we started doing public events. The public events became part of the internship course, but we also videotaped them so that the content could be included in our outreach efforts and the online textbook. We tried to do everything in a way that would serve more than one purpose and always have a public-facing element to it. Zoya: Who are the people who participate in the Texas Politics Project? Jim: Until four years ago, I created most of the intellectual content for the site with support from the Liberal Arts Instructional Technology Services (LAITS) on the technical end. When we started doing the polling, we brought in some graduate students as Research Assistants. Zoya: What about the internship programs? Is it mostly UT students who participate, or are there internship programs open to the broader Austin community? Jim: We have a few different internship opportunities. One is catered specifically to UT undergraduate students, and it is an upper-division internship course in the Government department. We also have two programs that are for the general public. We run a public bulletin board, a website where students can browse postings and find available internships, potential hosts, and employers. We get a lot of positive feedback on that. The other thing that we do that is not limited to UT students is run a Texas legislative internship seminar at the beginning of every legislative session. It is a day-long event in which people are going to be interns or new staff learn from veteran staff members in the Texas politics world. We have had people from the advocacy lobby community talk about ethics, journalists talk about dealing with the press and what the press is after, and parliamentarians of the house and senate talk about procedure and how the legislature operates. Zoya: I saw that you recently did a poll about #metoo. Could you use that as an example to talk about what the polling process is like, how you use the polls, and how you come up with the ideas for the polls? Jim: There is a hybrid sense of goals that get invested in the polls and color the process. Because we have a media partner in the Texas Tribune, we are mindful of their needs and their priorities, which are to be current, to inform public debate, and to drive traffic to their site. The #metoo poll was part of the battery on gender. It was one of a number of topics we focused on in this poll because it was in the realm of public discussion. We started putting the #metoo poll document together in mid-January when discussions of sexual harassment and sexual assault were really in the air. We knew that we wanted to probe attitudes on that and to see where it was in the political landscape of the state and the cognitive landscape of the voters. We asked questions about the perceived impact of the discussion of sexual assault and sexual violence, but we also revisited a couple of batteries that we had already put in previous polls that asked people about their perceptions of discrimination experienced by different groups of society. We wanted to see if this public discussion had any impact on perceptions of discrimination against women compared to other groups. We asked people: how much discrimination do you think this group of people experiences? The perception that women experience discrimination went up slightly after participants went through and assessed each group. We then asked participants to rank the groups by relative levels of discrimination. The most interesting result is that women did not move at all from previous surveys. We had asked the question in 2016, and only 3% overall in Texas ranked women first on that list. After the ensuing year and a half of the #metoo movement, all the high-profile cases of harassment and sexual assault, and the discussion and dissemination of those discussions over different realms—it was still 3% in February of 2018. Zoya: You mentioned earlier that you have gotten a lot of positive feedback on the bulletin. What other kinds of feedback have you gotten about the Texas Politics Project? Jim: Different aspects of what we do get different kinds of feedback. We have gotten really positive feedback on the textbook, though there was a little bit of a tricky transition from when we moved from being a free open resource to selling it. The thing we get the most dynamic feedback about is the polling. The polling has become, within the political community and media, an expected presence, something that is bound to generate discussion, feedback, criticism—particularly during campaign season. Our polls have really become part of the public political process in the state. You asked if we get feedback…it’s a feedback machine now! People expect the poll to be there, and we try to deliver. Zoya: How has working with the public in this way affected your own research? Jim: Working in Texas and working with the public led to a complete reorientation of my focus and my work, but it also led to a fundamental reorientation of what I thought of as my target audience. I am not a tenured faculty member, and I have created a different niche here that has been liberating for me. I am more interested in politics than I was in research scholarship in Political Science. The Texas Politics Project has created a vehicle for taking the tools I learned from my academic training and orienting them toward informing public debates rather than academic debates. Zoya: Is there anything else you would like to add? Jim: The thing we fundamentally try to do—and it is something that in the current political context might be more important or more urgent than it has been in my lifetime—is to provide the material for evidence-based arguments and evidence-based discussion in the public realm. What we are ultimately trying to do is to provide material that will help ground political discussions. We do not take sides or push certain political viewpoints. The agenda is really to use evidence and have some fact-based exchange.